I’ve told you about my love for all things Francis Mallman. Here is yet another winner that doesn’t necessarily need to be done over an open flame. I think that’s another reason why I like his cooking, while it’s great to grill, the winters sometimes are a little tough in this neck of the woods and an appetizer like this should not only be adored in the summer but over the coming holiday season as well. His style is simple, yet the combination of ingredients are unique, and nine times out of ten, taste irresistible. He also has a little story/history about each recipe that make each one special. I urge you to add this little treat to your holiday arsenal this year, you won’t regret it. adapted from Seven Fires by Francis Mallman. Watch your addition of salt in this recipe, the Anchovies pack a lot of it! Make Parsley Garlic Sauce then set aside. Heat a cast iron skillet over very high heat. 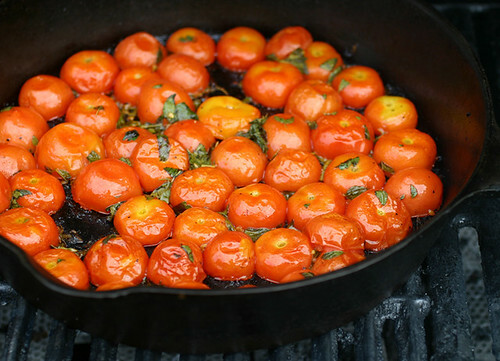 When burning hot, place the cherry tomatoes cut side down on the hot surface. Do NOT move them until they are charred, or nearly black on the bottom. You can work in batches if you like. remove from pan burnt side up. mmmmmm….they look tantalizingly delicious! I bet I could substitute your Chicago bacon for the anchovy. I could make a meal of them they look so good!!! Then substitute mayo for the goat cheese and you’d have yourself a gussied up BLT Unice! I don’t even like cherry tomatoes, but this looks amazing! I can’t believe how gorgeous it is and that it’s going to stay for a few days. Maybe you could ask your boss to let you get off early or come in later just so you could go for a walk. 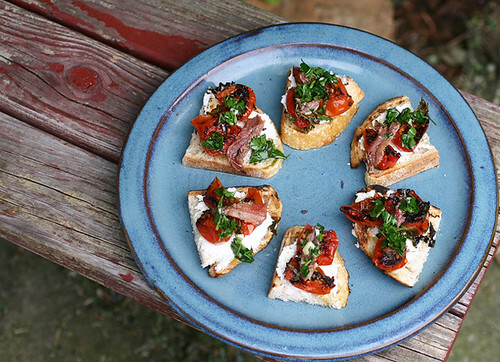 This looks like my kind of bruschetta. Yum!!! I am thinking my bruschetta days may not be over until July 2011. Love the charred version – wonderfully intense flavor. Yes! What gorgeous little bites! I’d sit with that plate and a glass of wine and be quite happy! Oh Mary this is wonderful… Would be perfect addition to our Christmas Eve feast! 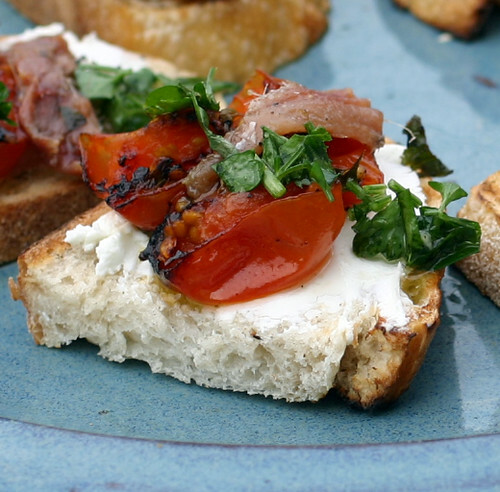 This bruschetta looks so lovely! I’d love this kind of thing for a dinner party appetizer. Yum! NomNoms! That looks seriously outstanding!